Welcome to Foojoy Teas, a most felicitous way to explore a range of fine teas, from the popular standards to the rare and esoteric! We've been importing tea since 1972 — sourcing directly from producing gardens throughout China — and selecting the cream of the crop for distribution to supermarkets and specialty food retailers across the country. Our various lines of packaged tea offer something for everyone, whether it is the convenience and excellent value of teabags for your daily fix, or top-grade whole-leaf teas for the discerning gourmet. Organic and decaf options are available for our most popular items, and we've recently introduced fancy flavored teas imported from Germany and elaborate "blooming" teas crafted by hand. 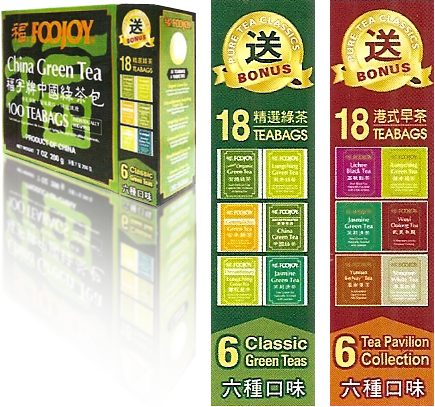 The China Green 100 Teabags are our most popular item, and you'll now receive a free sampler pack with each purchase!